1. Landlord: COMMERCIAL PROPERTY LANDLORD, INC, a _________________ corporation. 2. Tenant: AGREEABLE TENANT, INC., a _________________ corporation. 3. Leased Premises: All of the _________ floor of the Building. 4. Square Footage of Leased Premises: Approximately __________ RSF and ________ useable square feet. 5. Square Footage of Building: Approximately __________ RSF. 6. Nonexclusive Parking Spaces: In compliance with Legal Requirements; provided that Tenant will have the non-exclusive use of ____ parking spaces per 1,000 usable square feet in Leased Premises. 7. Term of Lease: _______ consecutive months following the Commencement Date. 8. Commencement Date: __________ (subject to Section 3.1). 9. Monthly Rent: $________ per RSF of Leased Premises (approximately $_________ per month, subject to adjustment when completed.). 10. Free Rent Period: Monthly Rent is abated for the first six (6) months following the Commencement Date as to all of the Leased Premises. Additional Rent shall not be abated during the Free Rent Period. 11. Rent Escalations: ________ percent (____%) per year. 12. Tenant’s Proportionate Share: Approximately _________% of Operating Expenses. 14. Tenant Improvement Allowance: $_________ per Usable Square Foot of Leased Premises or approximately $___________. 15. Option to Extend: One (1) five (5) year extension (See Section 3.2). This Lease (“Lease”) is made as of _________________, by and between COMMERCIAL PROPERTY LANDLORD, INC., a __________________ corporation (“Landlord”), and AGREEABLE TENANT, INC., a _________________ corporation (“Tenant”), (each, a “ Party ”, collectively, the “ Parties ”). The Lease Summary above is intended only as a convenient summary of certain terms of this Lease. In the event of a conflict between the Lease Summary and this Lease, this Lease shall govern. 1.1 Additional Rent: Defined in Section 4.2. 1.2 Affiliates: Agents, contractors, employees, invitees, licensees, and/or assignees, as the context requires. 1.3 Appraisal: An unbiased analysis and opinion by an Appraiser as to the Fair Market Rental Value. 1.4 Appraisal Demand Notice: A written notice demanding an Appraisal delivered by a Party pursuant to the terms of Section 3.2. 1.5 Appraiser: A “state certified general appraiser” (as that term is defined in _________ who has at least ten (10) years of experience in appraising commercial office building projects in _________ County, _________. 1.6 Base Year: _______ (provided that such consists of a full operating and assessed year). 1.7 Building: Defined in Section 2.1(a). 1.8 Commencement Date: The Commencement Date shall be the last to occur of ___________ or the Delivery Date. The “Delivery Date ” is ninety (90) days after both of the following are satisfied: (i) the final Plans (as defined on Exhibit “B”) are completed and approved by all governmental authorities; and (ii) bids are approved by Tenant. Landlord shall provide Tenant access to the Leased Premises prior to the Commencement Date to perform wiring and other work at such time as Landlord completes the Building in accordance with Exhibit B to a point where it can allow Tenant to safely begin Tenant’s Work; provided, Tenant acknowledges that Landlord and Landlord’s contractor shall be completing Landlord’s Work (as defined on Exhibit “B”), and Tenant’s entry for such purpose shall be subject to the reasonable supervision of Landlord and Landlord’s contractor. If the Delivery Date occurs on or before __________ but Tenant is not permitted to occupy the Leased Premises on or before __________, and, as a result, Tenant must continue to occupy its existing premises on a “hold-over” basis, then Tenant shall be provided a credit against Rent in the amount of $____________ for month or partial month beyond ___________ that Tenant is not permitted to occupy the Leased Premises, but only if and to the extent Tenant actually pays such amount to its existing landlord. Tenant’s entry prior to the Commencement Date for the limited purposes described above shall be free of charge; provided, Tenant shall indemnify, hold harmless and defend Landlord against any damage or caused by Tenant or its agents and contractors. If the Commencement Date does not occur on or before 180 days after the Delivery Date then, except if delayed for reasons of force majeure , Tenant shall have the right to terminate this Lease. 1.9 Common Areas: (a) all hallways, corridors, foyers, restrooms, porches, entryways, doorways, walkways, driveways, landscaped areas and other elements of the Property which are for the joint use of the tenants of the Building and their respective customers, employees, and invitees, including those Parking Areas located on the Property, notwithstanding that a portion of such elements are included in the calculation of the Rentable Square Feet contained within the Leased Premises (hereafter referred to as the “ Property Common Areas ”); and (b) the Parking Areas (except to the extent located on the Property), walkways, driveways, and landscaped areas located in the Project (but excluding any such areas located on the Property), (hereafter referred to as the “ Project Common Areas ”), and the benefits and burdens of any easement, and parking and other rights provided by any declaration of covenants, conditions, and restrictions affecting the Property and the Project, including the Declaration of Covenants, Restrictions and Easements dated ___________ (the “ Easements Declaration ”). The Property Common Areas and the Project Common Areas are collectively referred to as the “ Common Areas ”. 1.10 Condemnation Proceeding: Any action or proceeding in which an interest in the Leased Premises is taken for any public or quasi-public purpose by any lawful authority through exercise of the power of eminent domain or right of condemnation or by transfer under threat of condemnation. 1.11 Condominium Declaration: Declaration of Condominium for ___________ Condominiums recorded __________ as __________________ of the Official Records of the _________ County Recorder. 1.12 Fair Market Rental Value: The fair market value of the Leased Premises, determined in comparison to Class A buildings in the ________________ market area. 1.13 Free Rent Period: Monthly Rent is abated for the first six (6) months following the Commencement Date as to all of the Leased Premises. Additional Rent shall not be abated during the Free Rent Period. 1.14 Hazardous Materials: Any hazardous or toxic substance, material, or waste which now is or at any time hereafter becomes regulated or restricted by any governmental authority having jurisdiction over the Property. “ Hazardous Materials ” includes, without limitation, any petroleum products or byproducts, asbestos (in any form), chemicals, gases, or any other material or substance which upon exposure or ingestion may reasonably be anticipated to pose a hazard to the health or safety of the anticipated occupants of, or visitors to, the Property. 1.15 Initial Term: The Term, but specifically excluding the Extension Term. 1.17 Lease Summary. The Lease Summary (at the beginning of this Lease) serves as a convenient location for and summary of certain provisions of this Lease. The Lease Summary is part of this Lease, but must be interpreted in light of the provisions in the body of the Lease. 1.18 Legal Requirement. Any federal, state, or local law, statute, ordinance, code, rule, regulation, order, or decree applicable to a specified matter. 1.19 Monthly Rent: Gross monthly rent in the amount set forth in Section 9 of the Lease Summary. Monthly Rent is subject to a 3% annual increase for each Year of the Term, beginning in _______. 1.20 Mortgagee: The holder of any mortgage, the beneficiary under any deed of trust, or the holder of any other similar security interest which encumbers the Property or any part thereof. 1.21 Notice Addresses: The addresses listed for Landlord and Tenant on the Lease summary, as modified from time to time by either Party in a writing delivered to the other Party. (a) All costs, expenses, and amounts which are incurred by Landlord during the period in question or which are allocable to such period in connection with Landlord’s ownership, operation, management, or maintenance of the Property and Common Areas, including, without limitation: (1) premiums and deductibles for insurance carried with respect to the Property and Common Areas; (2) costs of supplies, materials, equipment, and utilities used in or related to the operation, maintenance, and repair of the Property and Common Areas; (3) labor costs, including without limitation, salaries, wages, payroll and other taxes, unemployment insurance costs, and employee benefits; (4) maintenance, management, janitorial, inspection, legal, accounting, and service agreement costs related to the operation, maintenance, and repair of the Property and Common Areas, including, without limitation, service contracts with independent contractors; (5) costs associated with maintaining office space for a Building manager and security personnel, including overhead and accounting expenses; (6) property taxes associated with ownership of the Property and Common Areas; and (7) costs of capital improvements, maintenance, or repairs made to the Property and Common Areas after the Commencement Date, including, without limitation, costs of: (A) reducing Operating Expenses, (B) improving the operating efficiency of the Building or Common Areas, (C) extending the life of the Building or Common Areas, and (D) bringing the Building or Common Areas into compliance with changing Legal Requirements; provided, such costs shall be either, in Landlord’s sole and reasonable discretion, (i) amortized over the useful economic life of the improvements (without regard to the period over which such improvements may be depreciated for federal income tax purposes), or (ii) recovered in each year to the extent that, in Landlord’s reasonable determination, the improvements reduced Operating Expenses for the applicable year. 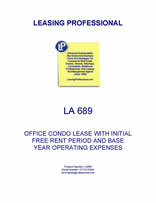 (b) “Operating Expenses” does not include: (1) leasing commissions; (2) repair costs paid by insurance proceeds or by any tenant or third party; (3) the initial construction cost of the Building and the Common Areas and any depreciation thereof; (4) debt service or costs related to the sale or financing of the Property; (5) the cost of tenant improvements provided for any tenant; (6) the cost of services provided to tenants for which a separate charge is made, including, without limitation, the cost of any service provided by Landlord to specific tenants that is not uniformly available to or performed for substantially all Building tenants (such cost to be allocated equitably among, and billed directly to, the tenants benefiting from the service); (7) costs arising from the gross negligence or willful misconduct of Landlord; (8) capital expenditures (except as provided subsection (a) above or elsewhere in this Lease); (9) costs of repair, restoration or other work occasioned by initial defective construction; (10) costs, fines and penalties due to Landlord’s intentional or grossly negligent violation of Legal Requirements; (11) costs and expenses associated with hazardous materials, waste or toxic substances; or (12) collection costs due to Landlord’s or any other tenant’s violation of terms and conditions of any lease. 1.24 Parking Areas: The areas within the Property or the Project designated by Landlord as suitable for parking by Tenant, other Building tenants, and their Affiliates including, without limitation, the Parking Unit. 1.25 Parking Unit: means the Parking Unit as defined in the Condominium Declaration. The Parking Unit is adjacent to the Property. 1.26 Permitted Assignee: (a) A person or entity that controls Tenant, is controlled by Tenant, or is under common control with Tenant (“ control ” meaning ownership of greater than fifty percent (50%) of the equity interest in the controlled entity); and/or (b) a person or entity that acquires substantially all of the assets or stock of Tenant. 1.27 Project. The larger mixed-use development of which the Property is a part, as described in and governed by the Condominium Declaration. 1.28 Rent: Monthly Rent and Additional Rent collectively. 1.28 Rentable Square Feet (RSF): Rentable square feet as measured according to ANSI/BOMA Standard Z65.1-1996 (or any successor standard). 1.26 Rules and Regulations: The Rules and Regulations set forth on Exhibit C hereto, as amended from time to time by Landlord. 1.27 Tenant Alterations. Defined in Section 9.1. 1.29 Tenant Improvement Allowance: Defined in Section 5.2. 1.30 Tenant’s Proportionate Share: The percentage determined by dividing the Rentable Square Feet of the Leased Premises (see Lease Summary Section 4) by the aggregate amount of Rentable Square Feet in the Building (see Lease Summary Section 5). 1.31 Term: The Initial Term set forth in Section 7 of the Lease Summary. If Tenant exercises its Option to Extend, “Term” shall include the Extension Term, unless otherwise specified or otherwise required by the context. 1.32 Useable Square Feet (USF): Usable square feet as measured according to ANSI/BOMA Standard Z65.1-1996 (or any successor standard). 1.33 Year: A calendar year during the Term other than the Base Year. (a) That certain floor area containing approximately the number of rentable square feet set forth in Section 4 of the Lease Summary (“ Leased Premises ”) on the ________ floor of the ___________ Building (“ Building ”), located at approximately _________________________________, which is referenced in the Condominium Declaration as Unit __, a legal description of which is attached hereto as Exhibit A (“ Property ”). For all purposes of this Lease, the calculation of Rentable Square Feet contained within the Leased Premises and the Building shall be subject to final measurement and verification by Landlord’s architect prior to the Commencement Date, and in the event of any variation, Landlord and Tenant shall amend this Lease accordingly. Tenant shall have the right to independently verify the calculation of rentable square feet contained within the Leased Premises and the Building; provided, any objection to the measurement of Landlord’s architect shall be made in writing within ten (10) business days after Tenant is provided with such measurement and the burden shall be on Tenant to prove the measurement by Landlord’s architect to be clearly incorrect. (b) In connection with renting and leasing the Leased Premises, Tenant shall have the non-exclusive right to use the Common Areas. Subject to rules and regulations promulgated by Landlord or its successors (“ Rules and Regulations ”), Tenant and its employees and patrons shall have the non-exclusive right to use the number of exclusive parking spaces (located in the Parking Areas) set forth on the Lease Summary. Landlord agrees that the Rules and Regulations shall be reasonable, uniformly applied to all tenants and not deprive Tenant of any material benefit provided under the Lease. The exact location of Tenant’s parking spaces within the Parking Areas shall be specified by Landlord. 2.2 Limitation. The Leased Premises do not include, and Landlord reserves, the exterior walls and roof of the Leased Premises, the land and other area beneath the floor of the Leased Premises, the pipes, ducts, conduits, wires, fixtures and equipment above the suspended ceiling of the Leased Premises, and the structural elements that serve the Leased Premises or comprise the Building. Landlord’s reservation includes the right with reasonable notice in the circumstance to install, inspect, maintain, use, repair, alter, and replace the foregoing areas and items and to enter the Leased Premises at any and all times in order to do so. If the rights of Landlord exercised pursuant to this Section materially and adversely interfere for a period of more than six (6) consecutive business days with the conduct of Tenant’s business in the Leased Premises and such interference is reasonably avoidable by Landlord, then the Monthly Rent payable under this Lease shall abate, from such sixth (6 th ) day until such material adverse interference terminates, in proportion to the extent of such interference, as the same may vary from time to time. (a) This Right of First Offer is subject to prior rights granted to tenants with respect to leases covering the ______ floor and the _________ floor. (b) In addition, this Right of First Offer shall not initially apply to any space on the ______ floor as to which Landlord has executed a lease or letter of intent prior to __________. On or before ___________, Landlord shall provide Tenant with a written notice of any space on the third floor as to which a lease or letter of intent has been executed which shall identify the space being taken and the proposed tenant. If the proposed tenant under the lease or letter of intent does not take occupancy, the space will become subject to Tenant’s right of first offer set forth in this Section. Likewise, upon the expiration or earlier termination of the initial lease with said proposed tenant, absent said tenant’s renewal or extension of its lease for said space, said space will become subject to Tenant’s right of first offer granted herein. (c) The maximum parking spaces that shall be available for the _______ floors shall be ______ spaces per 1,000 usable square feet.